property of the herb, namely sour (suan), bitter (ku), sweet (gan), spicy (xin), and salty (xian). (under-performance). In traditional Chinese medicine, they are seen as deficient or cold patterns. as in arthritis or leucorrhoea. intestinal tract such as spleen and stomach “disharmony”. cysts, and connective tissue proliferation. 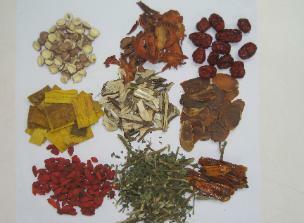 The unique characteristic of Chinese herbal medicine is the degree to which formulation is done. formula usually contains at least four to twenty herbs. are very convenient as they do not necessitate patient preparation and are easily taken. resulting decoction will be consumed several times during the day. home, but still retains much of the original decoction's potency. about 600 different herbs in common use today.